Rock Around the Clock Quilt is Finished !!!! 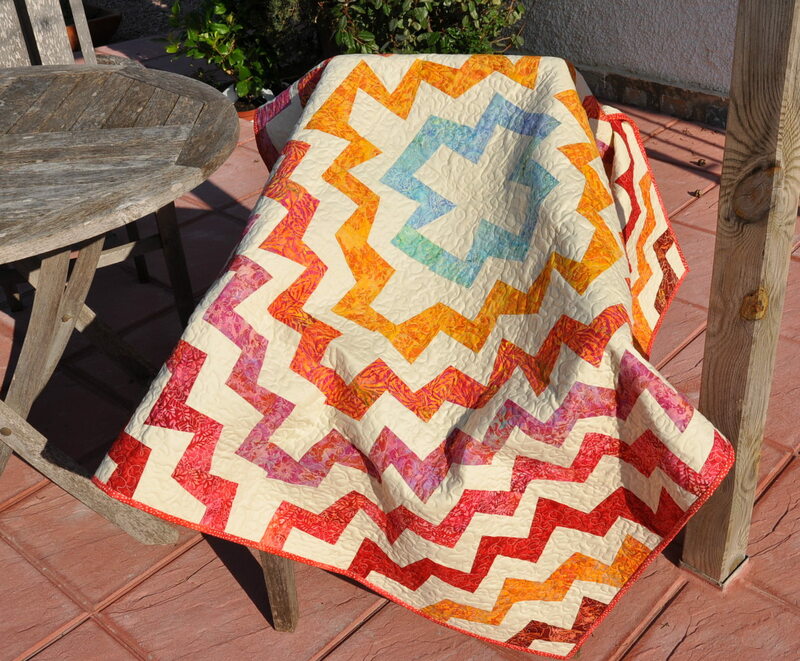 This quilt is now listed on my Etsy and Dawanda shops. This one is SOLD!! Yesterday was the day I decided that waiting longer to quilt the “Rock Around the Clock” sandwich will not make it any better. My hands felt a bit stiff (since a few weeks I did not have time to work on my patchwork projects), but my mind was longing to start. I decided once more for a free-motion pattern with my variation of meanders. Starting to quilt a larger piece felt a bit awesome in the beginning, but after a while I got into the right mood. I have finished the entire top in something over 3 hours. I also have managed to prepare the binding strips. So binding the quilt is my goal for today. Gone binding, enjoy your day! Yesterday was my lucky day. I’ve been listed in the Etsy Spring Lookbook 2012. please use this link to open the online version, my Etsy store Skala Bara is on page 74! I’ve had also a check at the hospital and I am in total remission with my lymphoma. Thanks God, everything is OK 9 months after finishing with my chemo. And last but not least – my hubby Helmut invited my for meal at our local Indian restaurant. And this means no cooking in the evening, hurrah, hurrah. Spread the backing right side down on the floor. Tape it firmly to the floor (using strips of painter’s tape), the fabric is completely smooth. Remember : both backing and batting should be approx. 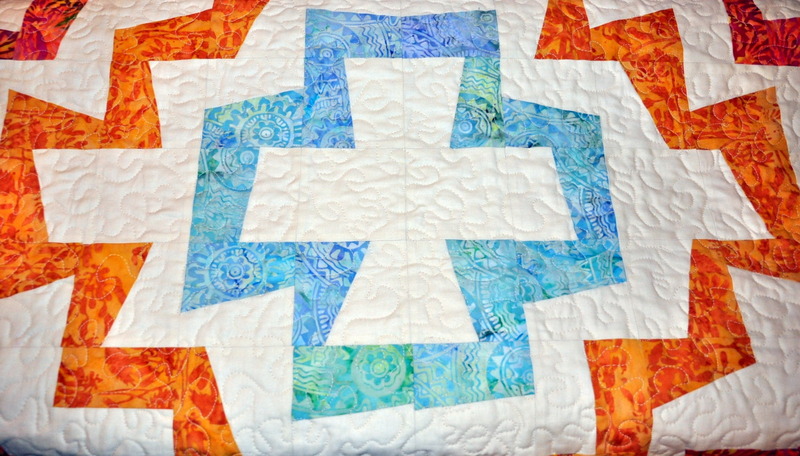 1″ bigger on each side than the quilt top. Detail of taping. 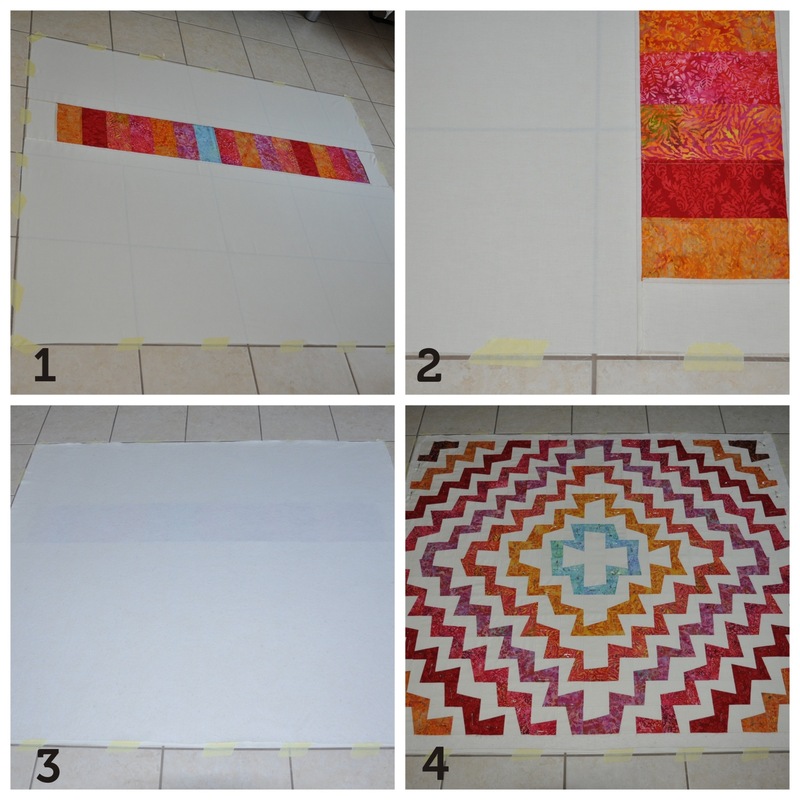 I use the tile grouts as orientation lines for positioning the quilt backing and top. Spread the batting on top of the backing and smooth out any wrinkles. Spread the (well ironed) top on the batting. Starting from the centre smooth out any wrinkles. Watch the correct alignment of the backing and top. this is your last chance for correction before pinning. I use curved safety pins, start from the centre and pin carefully through all 3 layers (backing, batting, quilt top). Once you have pinned the entire sandwich remove the tape, fold the sandwich and you can start quilting! At the moment I am thinking about the quilting style for this special top. 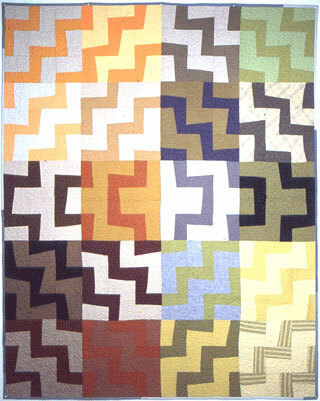 Should I go for free-motion quilting (with less experience) or for straight lines with a walking foot? 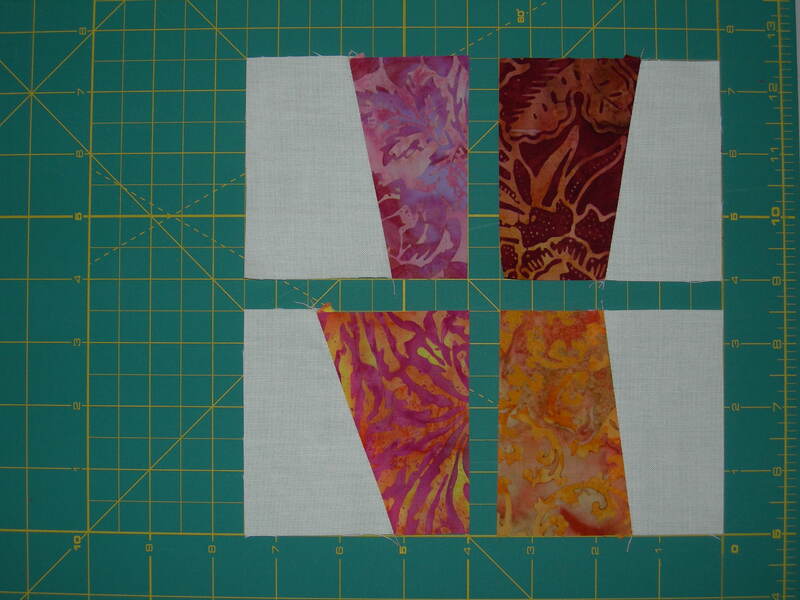 Since I have not decided yet, I started a new project with the same wonderful batik fabrics, it is a HST Quilt. So one more quilt finished and listed on Etsy and Dawanda. SOLD !! I hope you can see the little red bird that is hidden in the center block. I am happy with the design: this is also a project that can be done in a “wonky” style. Instead of cutting all the fabrics exactly, you can cut and sew together improvisationally. 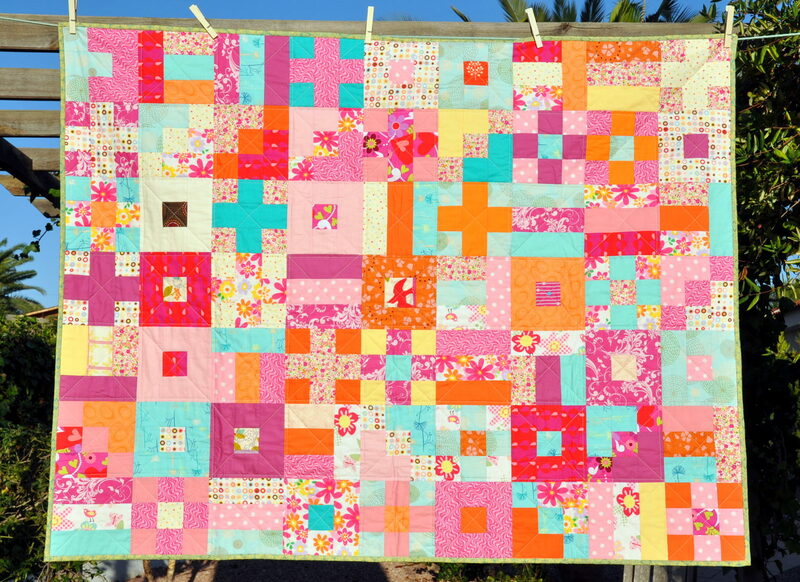 Just think first about the block size and the finished quilt size, get out your scraps or chosen fabrics and go for it. 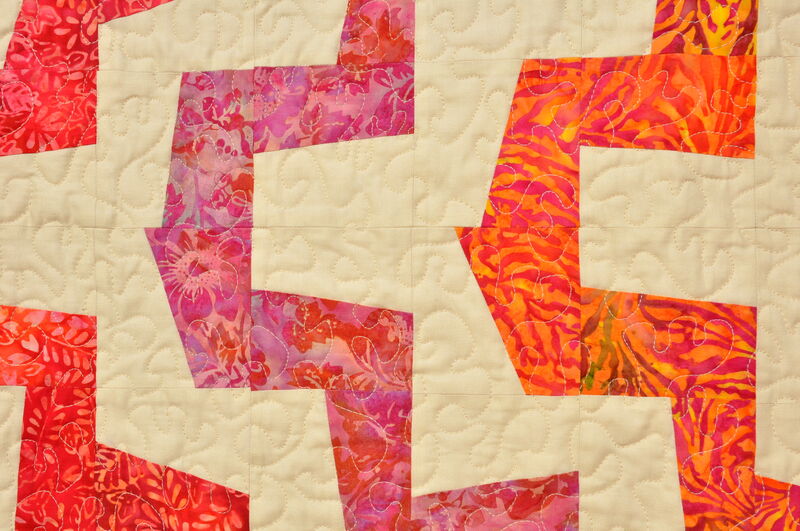 Cut, piece and trim the blocks to your desired size, sew together, prepare backing, batting and baste. Quilt as desired and bind the quilt to finish. 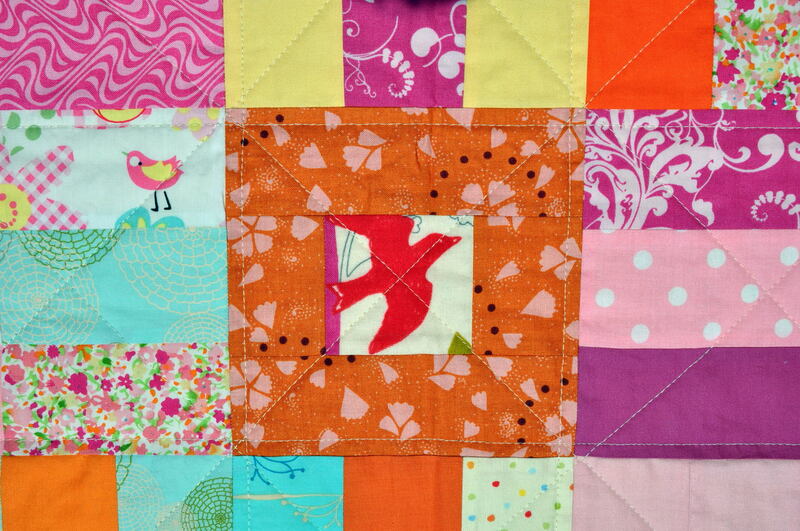 Whilst working on the Red Bird Quilt I found an interesting pattern on Quilters Newsletter. It is 9 patch block wonky variation of a classical London Stairs Block. Instead of making each 9 patch block in various color combinations, I decided to “rock around the clock” and use one solid for the entire quilt and a different color for each “circle”. 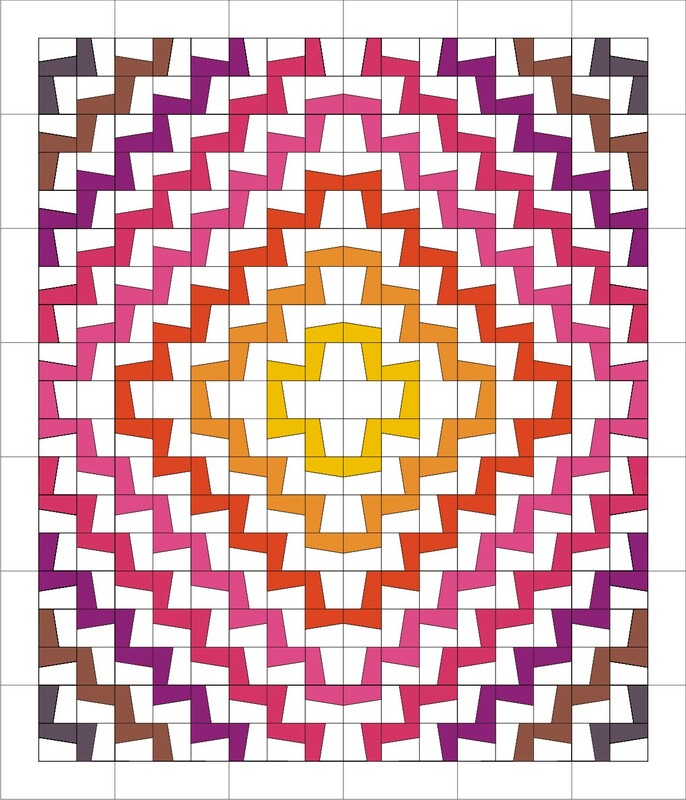 Before starting with the quilt I got on my computer and drawn the design. 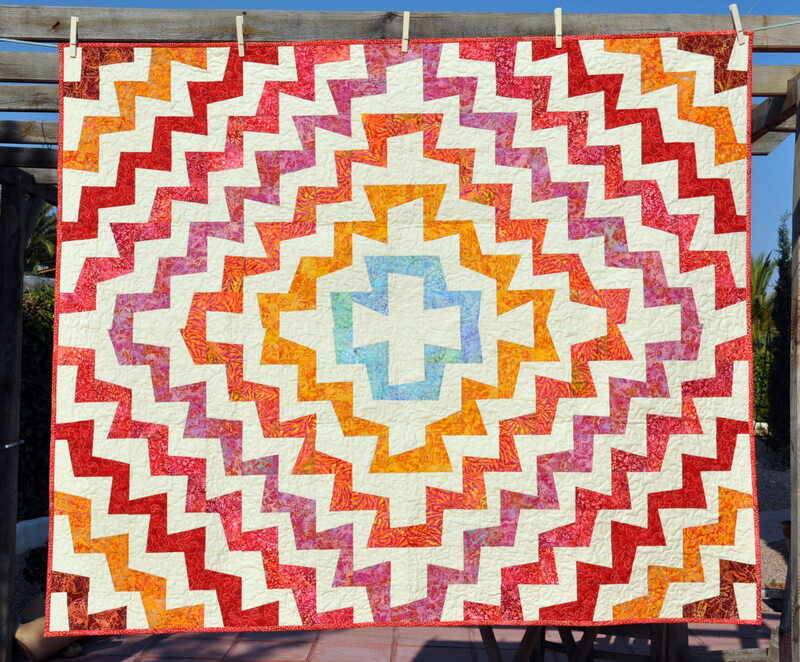 With 20x nine patch blocks, each of them 9″ square when finished, making the quilt size 36″ x 45″. I found a matching solid fabric in ebony, got out the batiks, cut 3,5″ wide strips and started piecing. Referring to my quilt assembly diagram I arranged the first 6 rows with units on my design wall and sewn them together. After taking a close look on the finished part I decided to add-on each side 2 more units. In the end this quilt has not only 20x nine patch blocks but also 18 blocks of 2 units x 3 rows and 4 units x 2 rows for the corners. 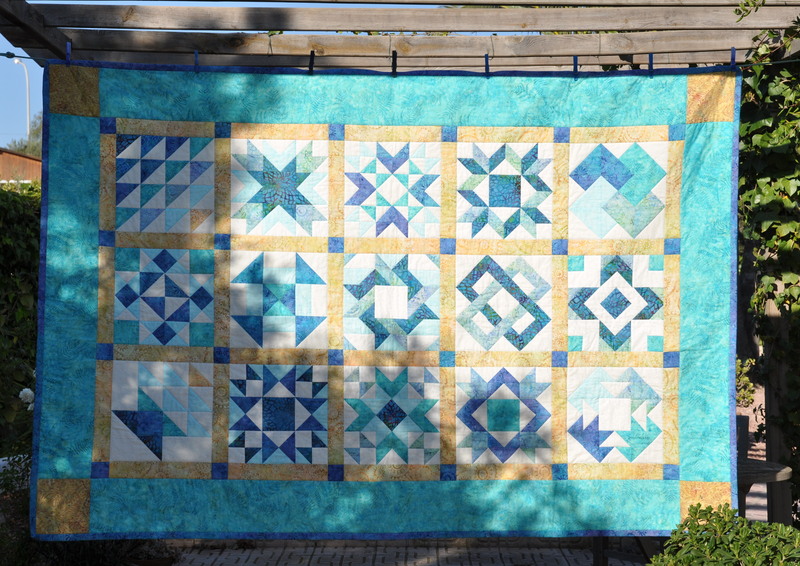 The quilt size is now 48″ x 57″ and has altogether 304 units. each 3,5″ square. On the picture you can see the unit and block distribution. Once more : it is important to cut and piece exactly. Square up your finished units to 3,5″ and the 9 patch blocks to 9,5″. Check your seams if the they are larger or smaller, redo if necessary. Otherwise the blocks may not join properly and your top is out of scale.